The clinical-stage biopharma gave back some gains made earlier this month, but is still up for November. Shares of Cara Therapeutics (NASDAQ:CARA), a pre-revenue biopharma company focused on developing treatments for inflammation and pain, fell over 16% today. This appears to be a sign that investors are allowing the stock to cool off after a 70% rise from the beginning of the month to Nov. 16. Excitement is building for Cara Therapeutics, as it expects to announce results for its three leading clinical programs in the next six months. The trials announcing data are investigating the safety and efficacy of its lead drug candidate, CR845. The studies include a phase 3 trial for postoperative pain (intravenously administered CR845), a phase 2 trial for chronic pain (oral CR845), and a phase 3 trial for the severe skin-itch condition known as pruritus (intravenous CR845). The company's only other drug candidate, CR701, has yet to begin phase 1 trials. Of course, given the pre-revenue nature of the company, investors should be reminded that the next six months could also determine its fate. If all of the trials fail, then investors will be left with one early-stage drug and a greatly reduced cash pile. If two or three of the trials succeed, then investors could be in for considerable upside. It remains a risky, binary bet. 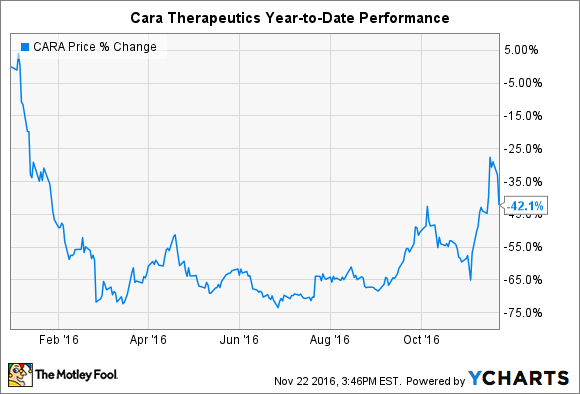 Investors can expect continued volatility for Cara Therapeutics heading into the announcement of trial results, as the market nervously considers all possible outcomes. After data are released, all bets are off.